Donatello travels by foot from New York City to Chicago, where his brothers are investigating the vampire sightings they heard about on the news. The brainy terrapin was able to sleep during the journey, even though his cybernetic body continued on its way. When Don arrives, he discovers Leonardo trying to fix what remains of the Triceraton aircar that had been stripped on the streets. Donatello sneaks up on his brother and scares him, causing Leo to tear the blueprints apart in surprise. Leonardo gets angry, but he quickly calms down and worries how they’ll be able to repair the vehicle without any plans – and Donatello replies that he doesn’t need “no stinkin’ plans” and promptly gets to work on the frame, using the parts that Leonardo was able to retrieve from the thieves (and some spare parts he finds in the Knight Watchman’s garage). Meanwhile, the Savage Dragon is being interviewed by TV reporter Roxanne Wells at the scene of a murder. Wells questions SD regarding the recent rash of “vampire” victims being found throughout Midway City and the Dragon explains that there are no leads at this point and cautions viewers to remain in their homes. After the report is finished, a police officer tells Dragon that he has some visitors – two short guys in trenchcoats – none other than Raph and Mike. SD explains to the Turtles that Chitown is filled to the brim with super heroes and villains, so they don’t need the disguises. The ninjas remove their coats and Raphael describes the reports of a vampire that brought them here, hoping to find their Sensei in his new form. The Savage Dragon takes the lads over to the corpse and shows them the body, which has been drained not just of blood, but its very life force. Mike and his brother conclude that Splinter couldn’t have been responsible for the murder and head off. Raphael decides to hit a local Go Go club while Mikey goes off on his own adventure. Raph, of course, gets into a barroom brawl while Mikey pays a visit to fellow reptilian mutant, Sarah (whose superhero moniker is Horridus). Back in the Big Apple at April’s apartment, a man shows up claiming to have a prize for Arnold “Casey” Jones. April quickly surmises that the guy is from the mob and hunting for Shadow, so she tells him that Casey moved away when she bought the place and she doesn’t have his current address. The man leaves, but April knows that her troubles have only begun. Don and Leo are flying around Chicago in the newly redesigned aircar looking for Mike and Raph when they spot the Dragon interrogating some super villains. The Savage Dragon gets tough with the criminals’ leader, who orders his minions to attack, but before they can react, Don lands the vehicle and the brothers offer their friend a hand. 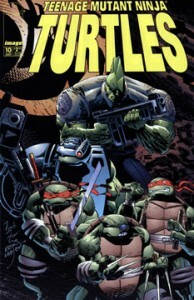 Some of the villains mock the Turtles, so Don blasts them with his gun arm. This causes the crooks to wander off, promising SD that he’ll pay for this. Dragon doesn’t seem too concerned. Roxanne Wells arrives suddenly and tells SD that she’s been able to link the killings. Apparently a prosecuted murderer named Johnny Lee Raeburn was sent voluntarily into space on an exploration mission to avoid a harsher sentence. The ship lost contact with the Earth years ago and everyone thought that the crew was lost, but the victims of the “vampire” were all involved in Raeburn’s trial. Ms. Wells believes that Raeburn has somehow returned from space and is seeking vengeance against those who convicted him. Dragon buys her story and he, Leo, Don and Roxanne jump into the aircar to head over to the apartment of the judge who presided over the case. When they arrive, they see some sort of mechanized monster draining the life out of the judge!